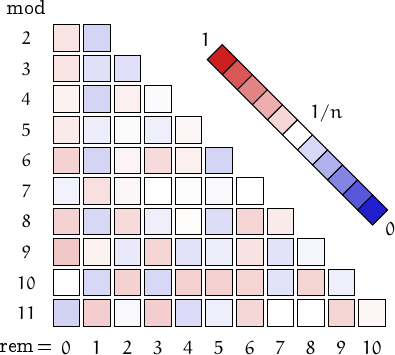 These are numbers whose representation can be split into two numbers, say and , such that the Fibonacci-like sequence which uses and as seeds contains itself. For example, 549 is a fibodiv since it can be divided into 54 and 9 and they produce the sequence 54, 9, 63, 72, 135, 207, 342, 549,... containing 549 itself. Note that the 6 fibodiv numbers with 2 digits are, by definition, repfigit numbers, too. It is easy to see that there are infinite fibodiv numbers, since the numbers 19, 199, 1999,... and 28, 298, 2998,... are all fibodiv numbers. 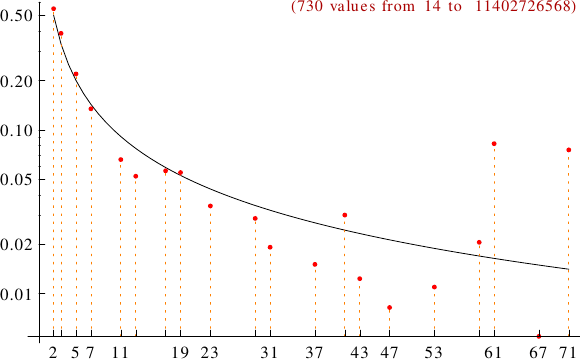 A graph displaying how many fibodiv numbers are multiples of the primes p from 2 to 71. In black the ideal line 1/p.